Midnight Muse Publishing, 9781943800070, 344pp. 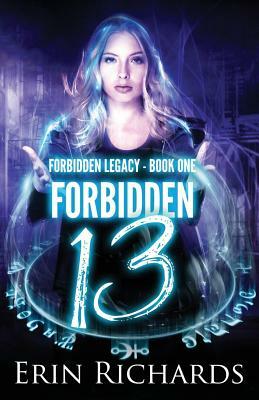 The number thirteen follows Aria Elle Walker like a bulldog. Lucky or unlucky, it triggers her telekinesis in freaky ways. In an era of banned magic, it could get her jailed...or worse. One Friday the 13th, Aria's telekinesis goes wild and she accidentally kills a bounty hunter in her home. Before her freakout begins, in walks Ronan Riley, another "thirteen" telekinetic, and his doppelg nger-a dying Forbidden fairy. Hells bells, everyone knows fairies and the Forbidden are extinct After claiming she's the gateway "key" to releasing ancient magic into the world, the doppelg ngers whisk Aria away from the goons Ronan's father hired to snag her. Dodging bounty hunters and screwy magic, the trio race to fix the damaged Rift before tainted magic kills the doppelg ngers...or opens the floodgates to abolished magic. But Aria never expected their desperate alliance to generate a force of a different kind...an uncanny bond and undeniable desire for both doppelg ngers. Destroying Ronan's father, the mastermind behind the mayhem, is just icing on Aria's chaos cake. If her luck cooperates and doesn't kill her first, that is. And will unluck add Ronan to the body count after he betrays Aria? USA Today best-selling author, Erin Richards, writes suspenseful paranormal, fantasy and contemporary young adult fiction with a splash of romance. You'll typically find Erin's characters in peril, whether based in reality or in a fantasy setting. Magic, murder and mayhem are all in a days' work! Erin lives in sunny Northern California, and in her spare time, she enjoys reading, photography, and re-landscaping her backyard, even though she hates digging holes...unless she's burying fictional bodies! Erin also confesses to a fascination with American muscle cars...and reality TV shows. For more information about Erin and her novels, please visit her website at http: //www.erinrichards.com.